Creating your college dorm checklist is pretty hard work. There are so many dorm essentials to think of when you are dorm room shopping, it can be overwhelming. On top of thinking about the dorm necessities you need to make your college dorm room more comfortable, you also are thinking about how to make your college dorm room a place that your friends will want to hang out in. All of these things are pretty overwhelming when you put them all together, so as you're putting together your college supplies, don't forget about cheap dorm supplies like dorm wall art. Dorm wall art like college posters will make your college dorm room feel instantly comfortable and home-like. Maybe you want some unique dorm wall art for your college wall decor. You want some scenic views but don't really want New York City or Las Vegas. Or maybe you want to add another unique scenic view to those other posters for dorm rooms! 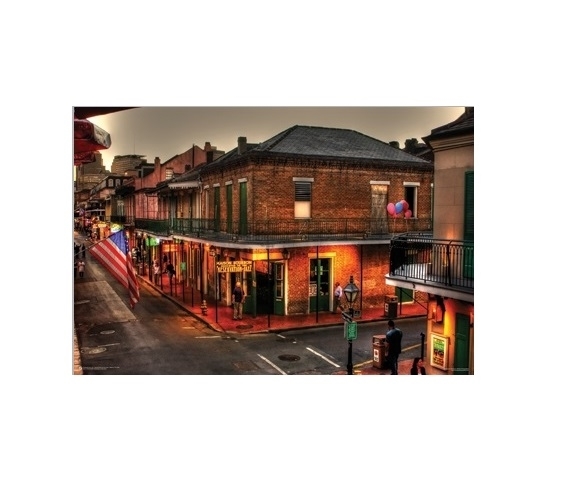 Our Evening On Bourbon College Poster is a fun dorm poster that will add some warm tones to your dorm room decor. This dorm necessities item features buildings on Bourbon Street to add some classic style to your college wall decor. The buildings have a warm glow from the lights and in the backdrop is a gray night sky that highlights the scene on the street. Add warm notes to your college dorm room with college posters like our Evening on Bourbon Dorm Room Poster!